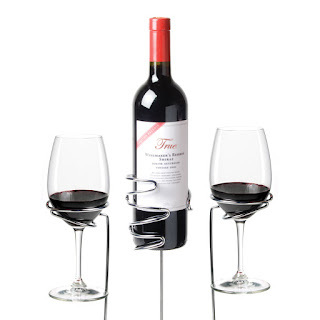 Turn picnics, outdoor parties, beach outings and more into special events with this clever 3-piece wine stake set. Set includes three wine stakes to elevate one wine bottle and two wine glasses above the ground and hold them steady. Chrome stakes are lightweight and durable, and will accommodate most standard size wine bottles and glasses.